More important for the future is the clear disparity between the racial makeup of the millennial generation and of preceding generations. Millennials were born during a period of heightened immigration and more modest white growth (See Figure 1). The idea that millennials are a bridge to a much more diverse America is evident from looking at the post-millennial generation—persons now under age 18. Whites comprise just over half (51.5 percent) of this generation. Of this subset, people between ages one through five are minority white (see Figure 1). Nearly 34 percent of this group consists of new minorities, and almost a quarter is made up of Hispanics. A noteworthy demographic dynamic is making the young post-millennial generation more racially diverse – the absolute decline in the number of white children (persons under age 18). This began to occur between 2000 and 2010, and continued between 2010 and 2015. More white children are aging past 18 than are being born or immigrating. Although white fertility is low, it is the aging of the white population, with proportionately fewer women in their childbearing years, that is leading to a projected long term continuation of this trend. It is broad based, occurring in 46 states (see Table 2). This means that the route for youth population gain in most states is through minority gains, via fertility or in-migration; thus making the child population more racially diverse. Now, 14 states house “majority minority” child populations (see Map 2). 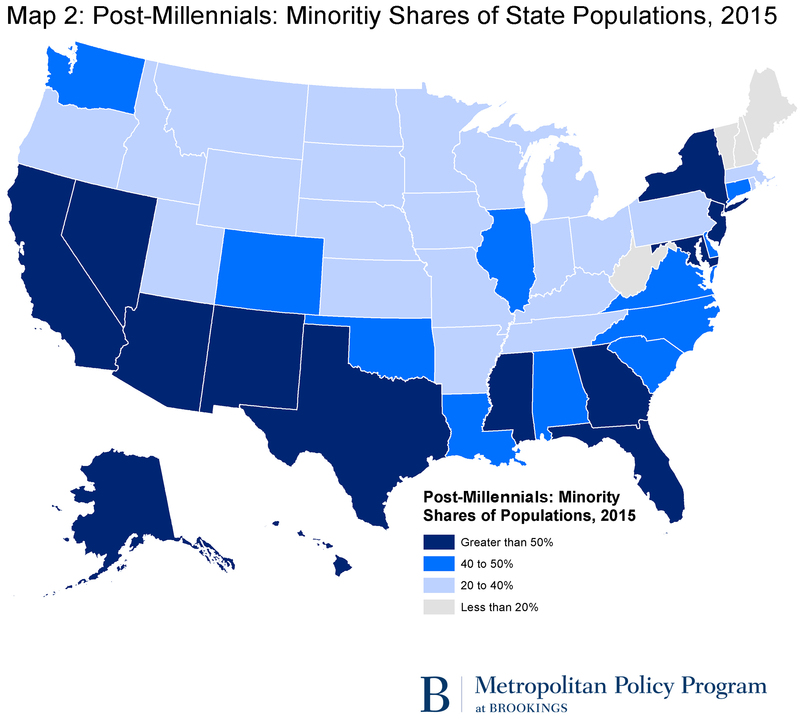 In California, minorities comprise nearly three quarters of post-millennials; and in Texas it’s two thirds. 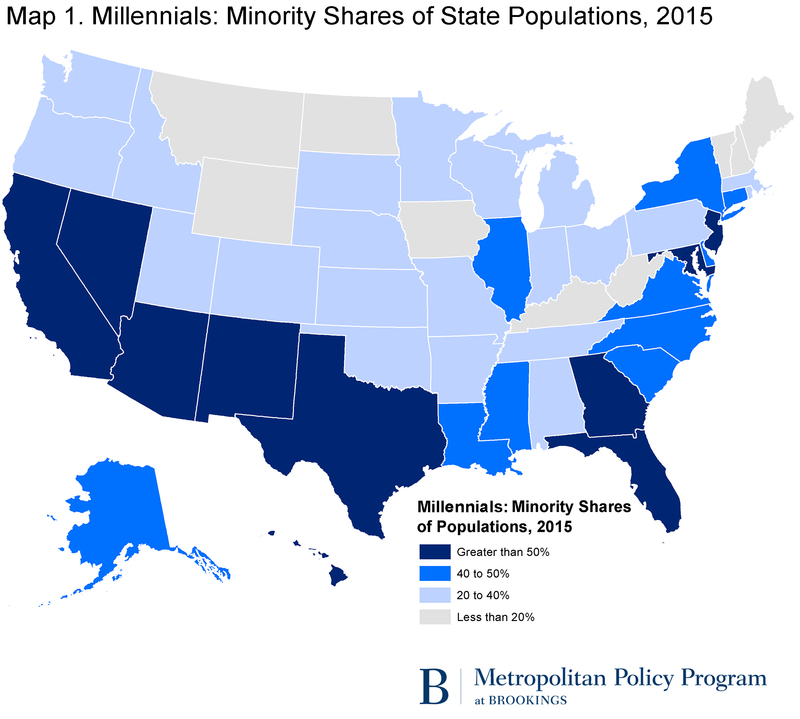 Overall, 25 states house post-millennial populations that are more than 40 percent minority and in only four (New Hampshire, Maine, West Virginia, and Vermont) is this generation largely white. The rapid growth of minorities from the “bottom up” of the age structure is creating a racial generation gap between the old and young that reflects the nation’s changing demography. This gap is spilling over into national politics with older white Americans resonating differently than younger minorities on issues like government spending, affirmative action, and immigration. The emerging political division associated with the racial generation gap represents just one area where members of the diverse millennial generation are on the front lines of change. While racial inequality exists within this generation (white millennials are better educated and less susceptible to the forces of poverty than Hispanics and blacks), its members have embraced positive attitudes toward diversity more openly than their elders, and are responsible for much of the recent rise in interracial marriages. As they move from young adulthood to middle age, millennials will serve as a demographic bridge between older, whiter generations and subsequent, more diverse generations. Their ability to assimilate, advocate, and become accepted will be key to the successful transition to a more racially diverse nation. Yes, millennials are worthy of attention. They are smart. They are creative. They are passionate about many issues. But the most defining characteristic of the members of this unique generation, as the country evolves demographically, is their racial diversity.